We all know that humans have been writing books since the invention of the wheel. But a lot of us forget that there are tons of amazing books about racing out there waiting to be read. That’s a crying shame. 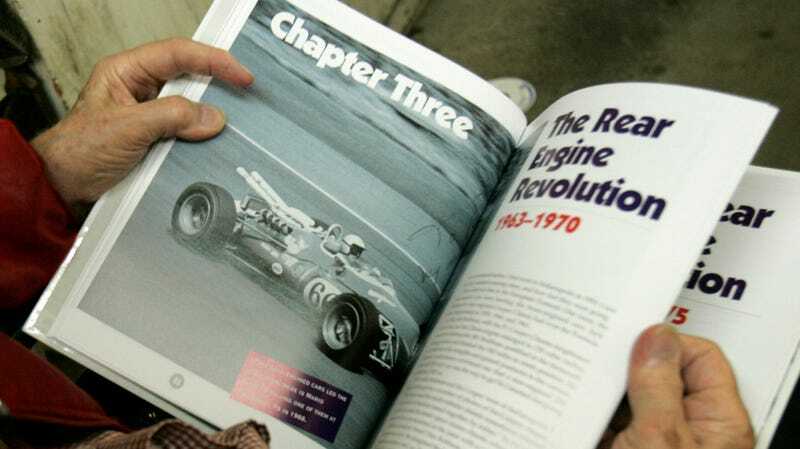 So, I’d like to formally invite you to take part in the Jalopnik Race Car Book Club. Similar to the Jalopnik Movie Club, we’ll tell you the book of the month. We’ll read it, you’ll read it, we’ll post a book review, and you’ll respond to the review with all of your steaming hot takes. At the end of each book review, we’ll include the next book in the list. Since books can be hard to find, I’m going to do my best to make sure that I choose books that are pretty easily accessible (think: Amazon Kindle, Google Books, or 2-day Amazon Prime delivery). But trust me on this one—it’s going to be worth it! I might be biased since I’m an English major, but you can get a whole heck of a lot out of a book, in a different way than you get things out of movies. There’s a whole world of books about race cars out there; it’s time we start diving in! But above all, we want to hear what you think! Leave your thoughts in the comments of the published review or email them to me (elizabethawerth@gmail.com)! Anything goes: talk about the writing style, the cars mentioned, the relative merits of how true things are in the book… you name it! I want to hear it all. And we want recommendations. If there’s a book you think we shouldn’t miss, leave it in the comments of this post or any of the other Race Car Book Club reviews! Such is the beauty of a book club. And that’s it! I, personally, have a backlog of books I’d like to start working through, and half the fun of reading is sharing your weird thoughts with everyone else afterward. Now, you’ll have until July 7 to finish reading and let us know what you think! That’s when I’ll have the book review published and the next book lined up and ready to go. So go out and get reading!